Obama's Justice Department nominee was initially met with bipartisan praise. Now the GOP is raising concerns about pardons and more. President-elect Barack Obama's nominee for attorney general, Eric H. Holder Jr., is now coming under fire from Senate Republicans, who have asked to delay what was expected to be a swift and easy confirmation over concerns about his role in some controversial Clinton-era pardons and other matters. Obama's selection of Holder initially was greeted with near-universal acclaim on Capitol Hill after Obama tapped him Dec. 1. Prominent Senate Democrats and even some Republicans rushed to voice their support for the 57-year-old former judge, prosecutor and senior Justice Department official. Senate Judiciary Committee Chairman Patrick J. Leahy (D-Vt.) on Tuesday scheduled the confirmation hearing to start Jan. 8, saying Holder needed to get to work immediately to restore credibility to a Justice Department tainted by years of scandal and politicization. But as deputy attorney general in the Clinton administration from 1997 to 2001, Holder played a controversial -- some critics say improper -- role in at least three clemency cases, according to congressional records and interviews. And now at least eight Republican senators say they want to delay the start of the hearings to Jan. 26, or after inauguration week, so their staffs can investigate those controversies. In a series of Senate floor speeches this week, they said Holder's actions in those cases raised questions about whether he could withstand the kind of White House pressure on the Justice Department that undermined the tenure of Alberto R. Gonzales over issues like the firings of U.S. attorneys and warrantless surveillance. Leading the charge is Sen. Arlen Specter of Pennsylvania, the top Republican on the judiciary committee. Specter met with Holder for more than an hour Monday to discuss his tenure as deputy attorney general, when Holder was the top Justice Department official on pardon issues. Specter said in a floor speech Thursday that he remained concerned, especially about Holder's key role in the most controversial one of the 177 pardons and commutations that President Clinton issued on his last day in office in January 2001 -- that of fugitive financier Marc Rich, whose ex-wife donated millions to Clinton's campaigns, his library and other Democratic causes. "I don't think it is useful to get into the specifics as to the precise concerns which I raised and his precise answers," Specter said. "But by analogy to the Gonzales tenure, I think it is imperative we be sure the attorney general of the United States does not bend his views to accommodate his appointer; that the attorney general does not bend his views in any way which is partisan or political, to serve any interest other than the interests of justice." Holder also took great personal interest in the politically charged clemencies granted in 1999 to 16 convicted members of a Puerto Rican terrorist group known as the FALN. The commutations came over the vehement objections of the FBI, all of the prosecutors who convicted the terrorists, and even one of the Justice Department's two top pardon officials, Margaret Colgate Love. In recent days, Specter and seven other GOP senators sent letters to the Justice Department and the William J. Clinton Presidential Library & Museum requesting an array of documents that they believe could shed light on Holder's role in the pardons and other Clinton-era controversies. The subjects they are interested in also include the independent counsel's investigation of Clinton and related impeachment proceedings; the controversial Justice Department-approved raid to seize Cuban refugee Elian Gonzalez in Miami in 2000; gun rights legislation; death penalty approvals and rejections; corporations under criminal investigation; and any denial of congressional requests for documents from the executive branch. An exhaustive 2002 investigation by a Republican-led House committee sharply criticized Holder for his role in some of the clemency cases, saying he appeared more intent on supporting the wishes of the White House than in doing the right thing as the nation's second-highest-ranked judge and law enforcement official. Holder has denied that, and supporters of his in both parties say he is among the most qualified and well- respected nominees ever. Holder testified numerous times about his role in those cases as part of the House investigation. Judiciary committee staffers say they are reviewing those statements and finding that Holder was never asked some fundamental questions about why he took certain actions in some cases, and about why he did not play a role in others when Justice Department guidelines and history indicated that he should have. "There is certainly the concern that we don't have the full grasp of what happened," said one senior GOP judiciary staffer, who noted that Holder at times refused to answer questions, invoking executive privilege because he had been advising the president. "We feel like we've just scratched the service in terms of looking at his record." Sen. Charles E. Grassley (R-Iowa) said he saw "red flags" not only in Holder's "judgment and independence" in the Rich and FALN cases, but also in the pardons of two women involved in the radical Weather Underground. On Friday, Leahy said in a statement that the committee was getting just as much time to background Holder as it had with previous attorneys general. He added that Holder was "a prosecutor's prosecutor" and that Holder had "acknowledged that the Rich pardon was a mistake." In a letter, Leahy urged the Republicans to swiftly approve Holder. He accused the Republicans of playing partisan politics with one of the most important Cabinet-level confirmations at a historically perilous time. Meanwhile, judiciary committee members were making their way through 145 cartons of documents that pertain to Holder, the senior staff official said. But Specter said they had not received the detailed questionnaire that Holder must submit or the results of the FBI's background investigation into him. The staff official also said that investigators would review Holder's public speeches and record as a private attorney in recent years, including his negotiation of a plea deal for Chiquita Brands International to settle a long-running Justice Department investigation into its admission that it paid at least $1.7 million in protection money to terrorist groups in Colombia. The GOP senators and staff suggested that the hearings themselves would be lengthy, noting that even the confirmation of their former colleague John Ashcroft as attorney general in 2001 came after two days of testimony from him and two days of testimony from 23 others. Mike Vanderboegh recently provided us with still more background on why Holder's nomination should be defeated, and David Codrea has issued his call to action. So what's to do now? 1. Go to the Senate website and find the contact info for your two Senators. 2. Note the telephone number, fax number, and mailing address for each Senator. 3. Write a calm but stern letter to each Senator directing him or her, as your elected official, to oppose Holder's confirmation as Attorney General, and cite your reasons. 4. Close your letter by insisting on a written response within five days. I am writing you today, as one of your constituents from [insert your town], to direct you to oppose the confirmation of Eric Holder as the next Attorney General. Mr. Holder's prior government service as Deputy Attorney General during the Clinton administration demonstrated that he has neither the judgment nor the ethical compass to serve as our nation's top law enforcement officer. His decisions in the Marc Rich pardon, the FALN pardons-for-pay, and the investigation of the 1995 Oklahoma City bombing are more than enough to disqualify him from any future government service. However, even those egregious lapses in judgment pale in comparison to his removal of U.S. Attorney James W. Blagg in San Antonio and assistant U.S. Attorney Bill Johnston in Waco, Texas during the 1999 re-examination of the Federal slaughter of the Branch Davidians. Simply put, Mr. Holder is a political lackey and an apologist for executive branch misconduct, rather than the prudent and objective professional prosecutor demanded by the Attorney General's awesome responsibilities. 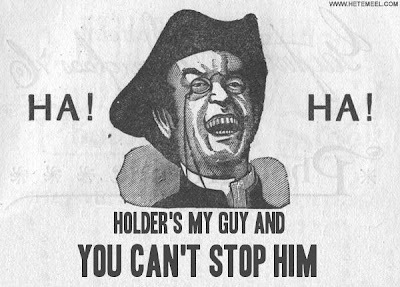 The Senate must refuse to confirm Mr. Holder, and I expect that your vote will be cast in opposition to his nomination. Please advise in writing as to your position in this matter within five days of the above date. 5) Fax a copy of your letter to each Senator and mail another copy to each Senator via snail mail. Fax another copy to each member of the Senate Republican Leadership; get that info from the Senate website. 6) Later that same day, call each Senator's office and ask to speak to a staff member. Get the staffer's name, then advise him or her that you have faxed and mailed a letter stating your strong opposition to the Holder nomination, reiterating your objections. Tell the staffer that you expect your position to be communicated to the Senator that day, and that you also expect a letter from the Senator stating his or her position in this matter. 7) Get your friends and family to do the same. Write the damned letter for them, if you must. Fax, mail, and have them make the calls. 8) Ditto for any gun groups to which you belong. 10) Spread the word by posting what you have done (and any responses from your Senators) on the various blogs and forums you frequent. Now -- do I really think we can win? a) Once Holder's nomination is conformed by the Senate, the game is well and truly on. - support the media blitz in favor of the "new anti-violence measures"
b) Scratching out a letter and making the phone calls as described doesn't take a lot of time or effort. If Holder is stopped, it's an immediate defeat for the new Obamite administration. If he does get the job, then anyone who did the Civics 101 drill above will have a new appreciation for just how effective those tactics really are in the waning days of the American Empire. Living in California I have extremely liberal senators and even some somewhat liberal friends & family. I've taken a slightly different tack here; I've been able to convince several of them to write letters of opposition to the Holder nomination based on his anti-privacy positions. Oh, boy, that old creepy feeling from the 90s is working its way up my back when old Single Bullet Arlen takes the "lead investigator" mantle once again. Anybody remember the questions he refused to ask in the Waco and Ruby Ridge hearings? We'd better be prepared to find somebody else on the committee to ask our questions. Because otherwise they won't get asked. e-mails on the way to Senators Hutchison and Cornyn of Texas, with snail mail to follow in the morning.